How do you apply Retin-A? How often should you use Retin-A? What’s the difference between Retin-A and Retinol? Can Retin-A be bad for you? Retin-A, also know as Tretnoin cream, is one of the most widely prescribed topical anti-aging products in the world. Tretinoin is scientifically proven to reduce fine lines and wrinkles by increasing natural collagen production in the skin. In most cases the effects are visible after 6-8 weeks of regular use. However, precautions must be taken, as overuse can cause skin irritation. Unlike the questionable claims of so many over-the-counter products promising youth overnight, Retin-A is scientifically proven to reduce wrinkles, improve skin elasticity, slow down the breakdown of collagen, and reduce the visible signs of sun damage. In short, Retin-A is the real deal — when used correctly. We spoke with Dr. Rhonda Klein of Connecticut Dermatology Group, New York plastic surgeon Dr. Scott Newman, and Dr. Alex Roher of San Diego Botox. Here’s what they had to say about Retin-A’s benefits and potential side-effects. Retin-A is one of the most recommended products of any topical anti-aging treatment. It helps to prevent wrinkles by building collagen, exfoliates to brighten the skin, and helps with pores and acneiform lesions. Retin-A, or Tretinoin as it’s known generically, is a skin cream containing a synthetic form of vitamin A that is only available by prescription. Chemically, it’s known simply as retinoic acid. While Retin-A does a wonderful job fighting acne, it’s real claim to fame is it’s ability to fight wrinkles and prolong a youthful complexion for many extra years. Well-known brands of Tretinoin include Renova and Avita. The active ingredient may be the same in these competing products, but the strengths and preparations are in fact slightly different. It’s also important to note that products containing retinol are not the same as Retin-A. While both Retin-A and retinol belong to the same family of retinoic acids, retinol is the over-the-counter cousin of Retin-A and its active ingredient isn’t nearly as effective. Retin-A is strong stuff. As mentioned above, it’s acidic. It’s also absorbable through your skin. The combination of these two factors make it something to be taken seriously. If you don’t want to leave your face looking like a tomato, start slowly and don’t attempt to hurry things along by using more than your dermatologist has prescribed. Start with a small amount of Retin-A, about the size of a pea. Use your fingers to apply it to your forehead, cheeks and other areas of your face. Use gentle circular motions to rub Retin-A into your skin until it’s fully absorbed. Retin-A tends to absorb very quickly. While you can apply it to your entire face, be sure to avoid the areas around your eyes and the corners of your mouth. Retin-A can cause your skin to become red and flaky. Following Retin-A with an application of moisturizer will help prevent you from getting dry skin. Alternatively, some people prefer to mix a pea-sized amount of Retin-A with moisturizer in the palm of their hand first — and then apply the entire mixture together. How often to use Retin-A largely depends on how often you’ve used it in the past. “Depending on the strength, it’s typically prescribed for topical use once per day,” says Dr. Newman. But if you’re just starting, you may want to start by applying it three times per week. If your skin tolerates it without irritation, try slowly increasing the frequency of your applications until you are able to apply it daily. While daily applications are what’s generally recommended, people with sensitive skin still can achieve positive results by applying Retin-A every other night. Eventually, you’ll want to include Retin-A as part of your daily skincare routine — applied just before going to bed. Tretinoin degrades in bright sunlight, so to get the maximum effect it’s best to use it just before you turn out the lights. Retin-A works by encouraging cell turnover in the skin, which is another way of saying it encourages skin cells to die and be replaced. While it may sound scary to accelerate cell death, the process makes room for and increases the rate of new cell growth. This means old, tired skin is replaced by younger, more beautiful skin. As we age our natural rate of cell turnover slows down. By speeding up the process Retin-A forces our skin to behave like younger skin. Encouraging cell turnover also helps to increase collagen production and thicken the deeper layers of skin, which in turn inhibits the formation of wrinkles. Does that mean Retin-A can make a 60-year-old look 22 again? No, it can’t, we’re waiting for that miracle product to emerge too. But with regular use Retin-A can smooth out fine lines and hairline wrinkles, although it does not work well for deep creases and hard-angled wrinkles. You could notice results within the first 2 weeks, depending on how fine your wrinkles are. However, for most people the effects of Retin-A become visible after 6 to 8 weeks. Improved skin thickness, skin elasticity and collagen production may take three to six months before becoming noticeable. Dr. Newman warns that acne patients should stop taking other topical medicines before starting Retin-A. “For this reason, it’s not unusual to see a worsening of acne at the beginning of a Retin-A regimen,” he says. While both are referred to as retinoid products, Retin-A is a branded, synthetic form of vitamin A, whereas retinol is a non-prescription, natural form of the vitamin. 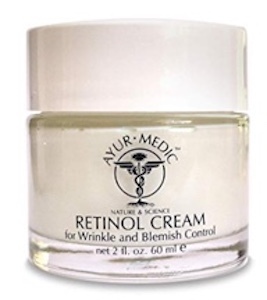 Even though over-the-counter retinol is also used in hundreds of skincare products, it doesn’t have anywhere near the punch of its prescription-only relative, Retin-A. While Retin-A is recommended by thousands of dermatologists around the world, there are still some potential risks you need to keep in mind. According to Dr. Newman, many of those risks are misunderstood or understated, which may cause the drug to be overprescribed in some medical practices. This is not to say that Retin-A is a deadly drug, but Dr. Newman prefers to err on the side of caution. First, if you’re pregnant you should probably stop using Retin-A immediately. The FDA has categorized Retin-A as a Class C drug during pregnancy. While this doesn’t mean it’s explicitly dangerous, it does suggest certain risks have not yet been ruled out. Tests performed on lab animals have indicated that there could be complications for pregnant humans, but a lack of testing on actual human subjects means there’s still not enough reliable data to make a definite ruling. So to be on the safe side, it’s best to put Retin-A on hold if you’re pregnant. When applying Retin-A you also need to be careful to keep it well away from your eyes. Retin-A can be used to treat crow’s feet, but extra care needs to be taken — given Retin-A can make your skin reddish and irritated, just imagine what it will do should you get it in your eyes? In the event this does happen, rinse your eyes immediately with water. It’s also a good idea to keep Retin-A away from the corners of your mouth, where it can cause excessive dryness and chapping. If you’re planning on getting a facial chemical peel, you’ll need to stop applying Retin-A a few days in advance of the treatment as it can leave the surface of your skin very tender. Combining a chemical peel with already-tender skin is a sure-fire recipe for pain. Lastly, Retin-A can leave you more sensitive to UV rays, making it much easier to get a sunburn. While it’s a good idea to apply sun block before being exposed to the sun anyway, when using Retin-A you need to be extra careful to do so. Your skin will thank you for it. Similar to retinoid based tretinoin creams like Retin-A, retinol creams can reduce wrinkles, treat acne, and lighten dark spots. While retinoids require a prescription, retinol is available over the counter. Retinol creams are also softer on skin and can be used as an alternative to retinoids by those with delicate skin. Ayur-Medic’s cream is a simple retinol product ideal for treating blemishes across the body. This retinol cream works by stimulating the body’s natural healing process, encouraging the growth of new collagen. When using retinol cream for the first time, it is important to ease your skin into the new routine. Begin by applying a small amount of cream once and waiting for a week before reapplying. Then apply the cream twice for the second week, and increase to three times a week the following week before finally applying the cream every other night. If your skin begins to feel irritated, reduce the application back down to once or twice per week. Radha Beauty’s retinol moisturizer combines the essential parts of a skincare regimen into one easy to apply cream. Using 2.5% retinol, Radah Beauy’s cream is best used for reducing fine lines and facial wrinkles. Green tea and vitamin E add to this balanced skincare package. 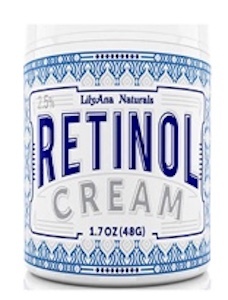 LilyAna Naturals combines retinol with skin nourishing ingredients like vitamin E, green tea, and shea butter. These added ingredients help to moisturize skin and make the cream suitable for nightly use. LilyAna Naturals cream is designed to be quickly absorbed by the skin to reduce oiliness to a minimum. 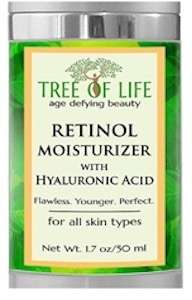 Tree of Life’s retinol moisturizer include hyaluronic acid (HA), an acid naturally found in the body that promotes skin healing. 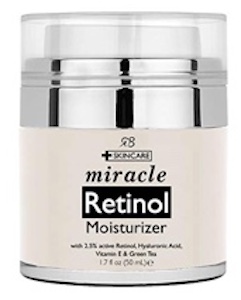 This 2% retinol cream is perfect for fighting the visible signs of aging. Tree of Life also offers discount codes for purchasing multiple products, so it pays to buy in bulk. 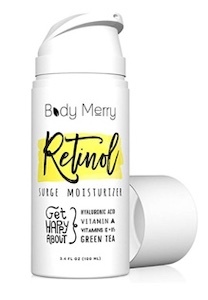 Body Merry’s retinol moisturizer also contains organic hyaluronic acid (HA) for a complete skincare package. Its compact design makes it ideal for travel while still offering twice the amount of moisturizer than the other products on this list. Body Merry’s cream is vegan friendly and Leaping Bunny certified.